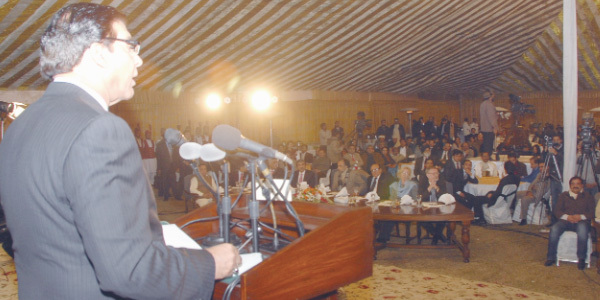 Prime Minister (PM) Raja Pervaiz Ashraf urged political leadership of South Asia to show courage, flexibility and statesmanship to dismantle political barriers and resolve inter-state conflicts for laying foundations of a regional economic take-off. There is immense scope of collaboration in the spheres of culture, sports, tourism, education, research, human resource development, poverty alleviation and environment among SAARC member countries, he said while addressing the annual conference of the South Asia Free Media Association (SAFMA) at the Governor House on Tuesday. The premier stressed for collective wisdom to evolve a South Asian vision and fraternity, adding that SAARC members must develop home-grown solutions to overcome poverty, unemployment and economic disparity. Underlining the need for close bilateral ties, he said SAARC members must allow for greater interaction among policy-makers, parliamentarians, businessmen, media practitioners, professionals and leaders of civil society. Stressing the need to overcome information deficit among member countries, he said all restrictions on access to free flow of information should be removed and media persons and products should be allowed free movement across frontiers. Ashraf regretted the fact that the region lagged behind the world despite immense natural and human resources, adding that South Asia was still deprived of basic health and educational facilities. The PM said South Asia could do well by learning from global best practices and applying them within the regional context for welfare of its people -a common cause for all member countries. “History will not forgive us if member countries continue to be bogged down by narrow considerations,” said Ashraf. He said 1.2 billion people of South Asia expected their leaders to exercise vision, statesmanship out-of-the-box thinking to make SAARC a booming regional bloc. The PM said Pakistan attached great importance to SAARC and is committed to the principles and objectives of the SAARC charter, adding that Pakistan had played a proactive role to make SAARC a model of regional cooperation, based on principles of sovereign equality. On bilateral trade ties, Ashraf said Pakistan supported liberalisation of intra-SAARC trade and looked forward to increasing its bilateral and multilateral trade with member countries of the SAARC region. “SAARC Visa Exemption Scheme has been instrumental in promoting people-to-people contacts including businessmen and media persons,” he said. Urging the need for reconciliation, Ashraf said the PPP-led coalition practiced the policy of reconciliation since its inception, adding that reconciliation was the vision of Shaheed Benazir Bhutto. “We need to resolve all political and economic issues with an open mind and sincerity of purpose,” he added. The premier asked media personnel to play their role in educating people on the socio-economic advantages of cooperation among member states and guide governments for a favourable environment that puts all countries on the path of development.